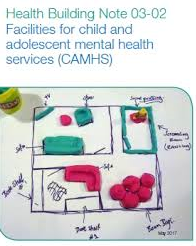 Peter Flanagan, Head of Transformation, and Paul Warwick, Clinical Lead for CAMHS Inpatient Service at Humber Teaching NHS Foundation Trust describe how they co-designed their new inpatient service with young people and how it aligns with the THRIVE Framework (Wolpert et al., 2016). Humber Teaching NHS Foundation Trust have been commissioned by NHS England to provide a new 13 bedded CAMHS inpatient unit, which will include 9 general adolescent beds and a 4 bedded psychiatric intensive care unit (PICU) for the young people of Hull, East Riding of Yorkshire, North Lincolnshire and North East Lincolnshire. The current CAMHS inpatient system can at times appear fragmented as the responsibility for commissioning, delivering and overseeing the services that support young people’s mental health can be provided by a number of different organisations. This can have a negative effect on the experience of the young person and their family as the systems often struggle to communicate, often leading to longer admission times. Our local experience of using beds is that the fragmented nature of their commissioning, coupled with the current location of inpatient beds, can often result in young people feeling disconnected from the people who matter most to their recovery; with community systems describing a sense of loss of the young person, and inpatient units becoming frustrated that community mental health and well-being resources do not support the development of effective discharge support packages. These challenges can result in longer admission times, affect the outcomes of the admission and increase the frequency of future readmissions. Listening to this feedback we identified a site for the new service which is situated within a socially inclusive and mutually supportive neighbourhood that benefits from long standing community leadership from The Goodwin Trust who are committed to the improvement in quality of life of young people and adults. The location is within easy walking distance of Hull city centre, with outstanding transport links and amenities as well as in close proximity to the local acute hospital. As an i-THRIVE Community of Practice member and not being an existing provider of CAMHS inpatient beds we have the opportunity to develop a fantastic new service that builds on the principles of the THRIVE Framework (Wolpert et al., 2016) and works in partnership with the current community resources to offer a safe and containing environment to the most vulnerable young people, adding to the existing clinical formulation not rewriting it. This will allow established therapeutic relationships to continue which will achieve better and timelier clinical outcomes for the young person. Working collaboratively with the community services to develop a comprehensive needs led package of care will allow the inpatient service to better predict the needs of young people and therefore allow the service to plan the most efficient use of the inpatient provision. This will offer a change to how inpatient units are traditionally viewed. The service will advocate shared decision making, a key principle of the THRIVE Framework, and the idea of “step in and step out” rather than “step up and step down”. This will help to change the perception of the service and encourage agencies to be truly invested in holistic needs-led care packages across all the needs based-groupings, whilst maintaining and sharing on going responsibility and accountability for the help and support provided across sectors. 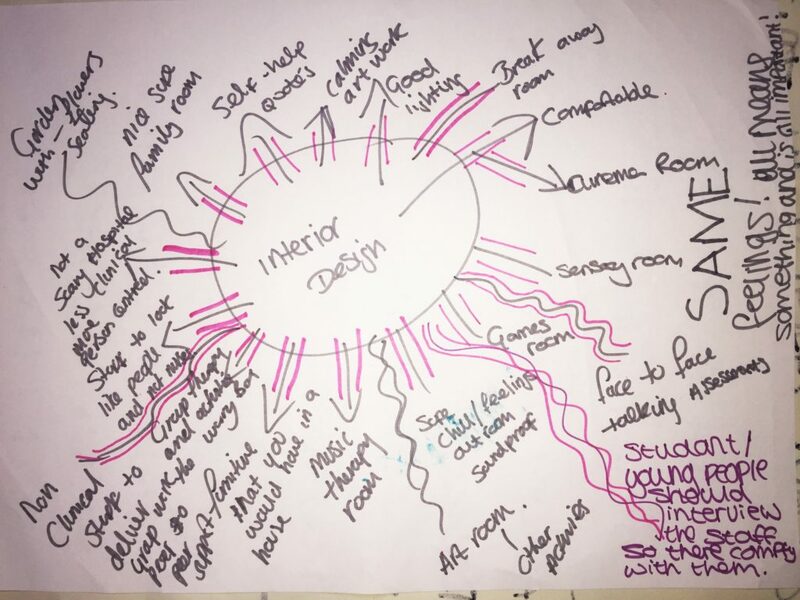 To build on this thinking and prior to any planning or thought around how the unit might look we wanted to hear the voice of our young people, capture their experiences, and understand what is important to them if they were to be admitted to a CAMHS inpatient unit. 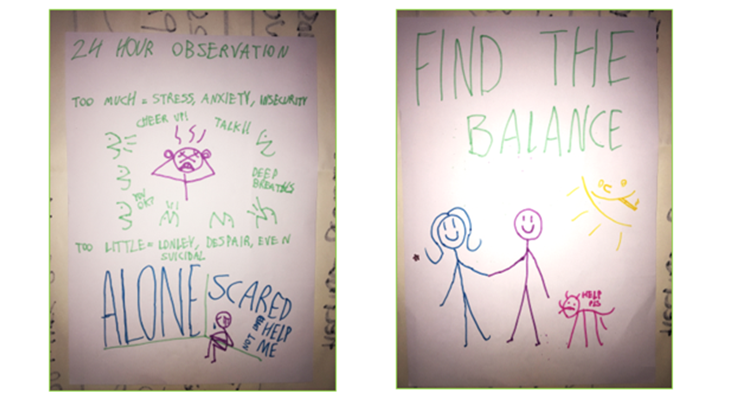 We hosted events on two separate evenings to ask our young people “What does a fantastic CAMHS inpatient unit look and feel like for you?”. It was important that we remained impartial in this process so as not to influence the narrative. To achieve this we commissioned an independent Leeds based organisation ‘m-habitat’ to lead the events. This theme continued across both evenings with the young people talking about access to services being very difficult. 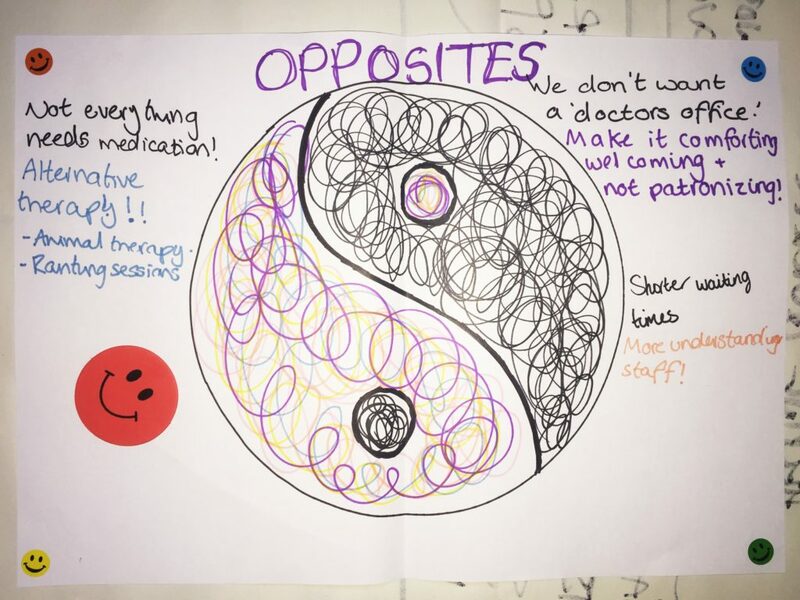 Some young people described a belief that they needed to present in a crisis for services to recognise that they are struggling and when a bed was required they then described the wait and how much pressure that put on their family. Young people spoke of particular issues around the importance of needing to feel safe and felt that this was often provided by the staff working in the service. Many described instances of being supported by staff who seemed over worked and “burnt out”. They focused upon observation levels and described a system where young people were never left alone which can lead to an escalation in their difficulties whereas too little support can lead to them feeling alone and “suicidal”. Leaving us with a clear instruction to “Find the balance”. Young people felt that recruiting the right staff could be supported by involving young people in the recruitment process. Clear messages around the service not looking too clinical and having a homely feel resonated throughout. Both parents and young people spoke of the issues around family visiting, often reporting on their being a lack of dedicated space for them and being fitted in rooms when they weren’t in use. Outdoor space was another consideration, reflecting that sometimes they encountered restrictions around using outdoor space due to staffing levels. The current commissioning arrangement for young people’s mental health presents a very interesting challenge. For young people experiencing mental health distress it is often about their relationships with the system, with their family, their peers and with themselves, yet the current system does not serve to support those relationships. Young people want an inpatient service that responds to their needs rather than a service that is only available when the system prescribes it. They want an inpatient unit to be seen as part of the total offer of support for a young person and their family. Representatives from the Department of Health who were writing the new Health Building Note for Inpatient CAMHS (HBN 03-02) attended the event and were impressed by the richness and quality of the suggestions of the young people that they took some of the young people’s suggestions and have included them as a case presentation within the building note. Using one of their images on the front cover. For the development of our service the discussions with young people have formed the building blocks of how we have approached this project, the young people’s voice and participation continues to have an ever strong presence in all aspects of the development of this new service. If you would like further information, please contact Peter Flanagan at: peterflanagan@nhs.net or Paul Warwick at: pwarwick1@nhs.net.